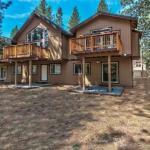 New Home Close to Heavenly w Pine Garden enjoys a location in South Lake Tahoe just 1.5 km from South Tahoe Ice Arena and 3 km from Tahoe Queen. This holiday home offers accommodation with a balcony. The holiday home includes 3 bedrooms and a living room with a TV. The kitchen has a dishwasher and an oven. Heavenly Ski Resort is 3.2 km from New Home Close to Heavenly while Washoe Meadows State Park is 6 km away. Reno-Tahoe International Airport is 67 km from the property.